While the Dow breaks new records and corporate profits continue to soar, one large segment of the population is not celebrating: American workers. 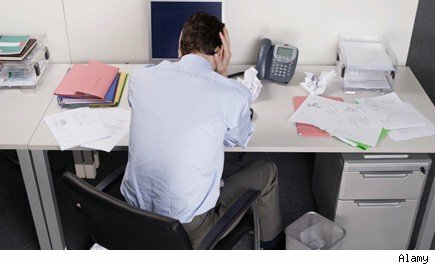 Not only are millions still struggling with unemployment, but according to a new survey by the American Psychological Association, a significant chunk of those employed are miserable -- feeling stressed out, underpaid and overworked. More than 1 out of 2 employees say their employers aren't bothering to solicit their feedback, and even more say employers don't make changes based on feedback. More than 50 percent say they aren't paid adequately. Most employees feel "stuck," with only 39 percent saying they feel they can move up in their organizations. The APA released its survey timed to giving out its "Healthiest Workplace Awards." As The Wall Street Journal wryly noted, 3 of the 4 top winners were based on tropical islands. The winners were Bowers & Kubota, a consulting firm in Waipau, Hawaii; Triple S, a managed care firm in Puerto Rico; Cancer Care Management Department at Christiana Care Health System's Helen F. Graham Cancer Center in Newark, Del., and Tripler Army Medical Center in Honolulu. Only 19 percent of their employees reported being stressed out, versus 35 percent in the APA survey. Are you stressed out at work? How do you think employers could improve the environment? Share in the comments section below.